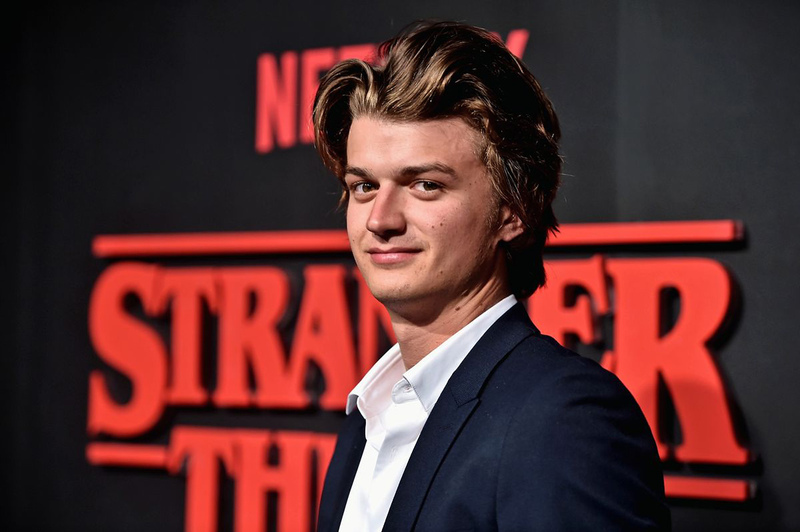 Interview: Joe Keery on 'Stranger Things', Post Animal, and his favourite Pokémon. There’s not many people in the world that I would get up at 5am in the morning to interview, but when the time arose to speak with Joe Keery (known to most as Steve from ‘Stranger Things’, and also Jean-Ralphio Saperstein’s supposed father), an early morning was worthwhile. He’s nothing but apologetic for getting me up early - “I’m so sorry to wake you up so early!” - and at the end of the interview instructs me to go back to bed. For a 24-year-old, Keery is doing remarkably well for himself, balancing acting (as well as his role in ‘Stranger Things’, he’s also starred in ‘Empire’) and being in a band - he’s in a six-piece psychedelic group called Post Animal, who take inspiration from the Australian psych scene, think Tame Impala and Pond. "...[At ten I] wasn’t playing Dungeons & Dragons, but I was playing dice-games, like ‘Warhammer’ and ‘Lord Of The Rings’, like, roll the dice and move-the-painted-figure games..."
JOE KEERY: Hmmm, probably listening to Stevie Wonder with my Dad. At our old house, he would, it sounds kind of cheesy, but he would play a bunch of different albums, and Stevie Wonder is the one that I mostly remember - he’d just play it while he was making dinner. So, probably that. JOE: I would say, probably in Middle School. I had a bunch of friends, like three or four guys, we would always-- kind of all decided that we would start playing music around the same time and then all kind of learned what we wanted to play, and various types of music - we discovered our interests together. So, probably Eighth Grade [NZ Year 9] was when we started. JOE: I think when we were doing that first release, ‘Post Animal Perform The Most Curious Water Activities’, we were all really loving ‘Innerspeaker’ by Tame Impala. We love the whole-- like, Pond, King Gizzard & The Lizard Wizard, those are some of our favourites. But in terms of the most recent stuff that we’ve been doing, we’ve been listening to kind of more classic music, Electric Light Orchestra, Steely Dan, and Stevie Wonder actually, and always The Beatles. We’re all pretty big Beatles fans, so that’s something that I think we’ll forever enjoy. CDM: I’ve seen from social media that you guys are currently recording another album - how’s that process coming along? CDM: You’ve said about the first album that it was a "pretty group oriented writing process for that album." How does the writing-process for songs in the group tend to work? Does someone come with a particular idea that gets developed, or is it entirely collaborative? JOE: A lot of them start at least that way, someone will have some sort of idea and we’ll kind of branch out of it, but a lot of times, new songs will come from when someone comes in and says, “Hey, I’ve got a really strong idea for three of the instruments that I think we should do." And maybe that’s how it’ll turn out, and that’s how it’ll start, but usually, I’d say especially with this one, we really wanted to come in with some ideas and make sure we weren’t underprepared or anything like that, but really make sure that we collaborated in the room as well. So, I think we kind of focused a lot on figuring stuff out as it brewed part-wise, and kind of just learning where you fit in the whole group. I feel like in that one week, we learned more about playing together as musicians than we have in like, the previous sixth months. It really solidified us as a six-man group, rather than a five, with an alternative someone who just kind of came in sometimes. It really solidified the way we work together, especially for this project. JOE: Well, that’s like the exact opposite, so you can have total control over everything. It’s a kind of blessing and a curse, because one of the best things about playing with other people is that when you get stumped, you can pass the baton on, hand the idea over, and maybe they’ll have a totally different idea which is way better than any one that you could’ve thought of. So I think there’s advantages and disadvantages, for sure. Recording music on my own, like that, has been something I’ve done for quite some time. Just started as kind of a hobby before Post Animal, and was kind of the reason I met those guys, and got involved in that band, so it’s something that I feel like I’ll do for a long time. It’s a really nice creative outlet to be able to just sit down, bang some tunes out, have some fun doing it - and then listening to it is fun, and sharing them with your friends. It’s equally rewarding, but has its own trials and tribulations. CDM: Because you once starred in a KFC commercial, I have to ask - what is your go-to KFC order? JOE: It’s funny that you say that, I don’t actually-- I think that was the first job I ever got, but I don’t really eat KFC. I feel like a bad spokesperson, I don’t ever really get it. CDM: You appeared in the season finale of 'Empire' Season One last year - what was your experience like working on that show? JOE: That was really cool. That was one of the first shows that I actually got a sizeable-- it’s not a huge part or anything, but I had a name. At the time, that was huge for me, that I was on some sort of television show. It was actually pretty stressful, because I knew there was going to be a really bad rapper, which is not a problem for me because I’m pretty bad at rap to begin with, so I was like, "Okay, great, I know how to do that!" But then when I showed up on the day, they had this whole-- I thought I was just gonna be making it up, but they had this whole rap written out that they, for some reason, it hadn’t been sent to me - so I had this stress of trying to learn this. And then the actual take, I’m pretty sure, they used of me in the show, is me actually just messing up in front of all of these people who I totally respected. I was super nervous. I think they got a pretty realistic embarrassing moment of me. CDM: I watched the scene you were in, and your rapping was really... something. I’m guessing it hasn’t inspired you to quit everything and become a full-time rapper? CDM: You were formally trained at The Theater School at DePaul University - is traditional theatre something you ever see yourself returning to? CDM: For the upcoming quick-fire round, complete the following sentences... You will like my music, if you like...? CDM: And you know you’ve made it when...? JOE: I would choose David Harbour, because he’s very knowledgable. I think he has a well of information inside of him that would be very helpful in a quiz situation. I imagine he could hold his drinks so he wouldn’t be a total... you know. I’d choose Charlie [Heaton] because he’s from a different country, so he might have a different perspective on the whole thing. And then I’d probably choose Matthew Modine, because that guy has been around for a really long time, and he is one of the smartest guys I’ve ever met, actually. JOE: It would probably be like some Hall & Oates sounding song. Either something like that, or maybe like <laughs> ‘Every Step You Take’ by The Police - kind of heartfelt, but also maybe a little bit creepy. JOE: Well, I’m still trying to figure it out for sure, but that guy is just the-- A) he’s just so talented, and he sent a little cover of him plucking along to one of our songs and it just about broke my damn heart. He’s such a sweet guy, and such a cool kid, and I wish I was that cool when I was that age. CDM: I feel like everyone feels the same about those kids, "I wish I was like that at that age." JOE: It’s something I really enjoy doing, and if people can listen to the music and lose themselves for a little bit, forget that it’s just a whole bunch of people playing instruments, then I feel like as a band we’ve kind of done our job, kind of what we set out to do - like, to transport people. And also to get them excited, and get them pumped up, especially at the live shows. JOE: For me personally, I think it’s lyrics. That’s why I think Paul McCartney has so many great songs, because he’s got these unbelievable chord-progressions for sure, but then he also just has these really insightful, short phrases, that can really, really stick with you - in The Beatles, and outside of The Beatles’ career. Like, 'Let 'Em In’, like ‘Uncle Albert / Admiral Halsey’ from ‘Ram’, then also ‘Hey Jude’ or something like that. Just a bunch of small phrases that really stick with you for some reason, but they don’t sound cliché. That’s kind of what I think of when I think of a great song. CDM: One of our writers saw him play Firefly Festival last year and said it was incredible - he played for two-and-a-half-hours. JOE: Probably, a moose - at least right now. I think a moose would be a good spirit animal for me. CDM: Tell me something not many people know about you...? CDM: And lastly, what's on your bucket-list that you'd really like to achieve? Post Animal’s ‘The Garden Series’ EP is out now - click here to purchase. MusicWatch: the 'Stranger Things' cast attend/be a part of a Mac DeMarco concert. FashionJoe Keery x GQ magazine, October 2017. FashionMillie Bobby Brown on the cover of Interview magazine, November 2016. MusicFinn Wolfhard announces role as Charlie in live 'Willy Wonka And The Chocolate Factory'. FashionMillie Bobby Brown on the cover of Elle Mexico, November 2017. FashionFinn Wolfhard x Paper magazine. MusicPost Animal announce Summer U.S. tour.